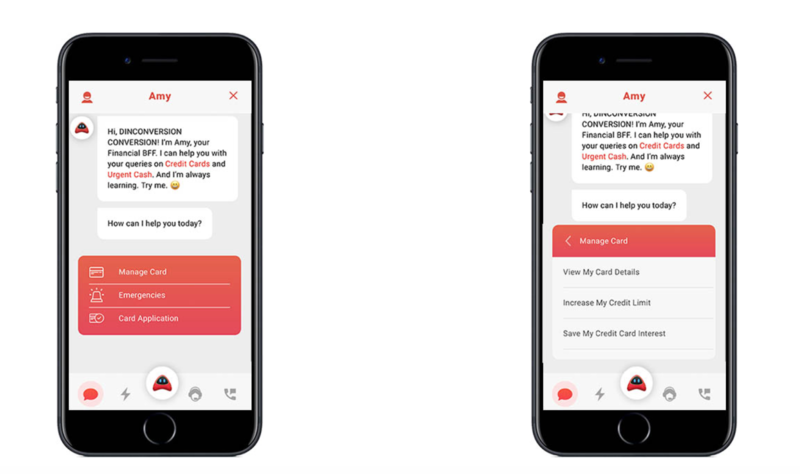 AmBank recently launched AMY, a virtual financial assistant that focuses on helping customers with credit card related matters. On the 29th of October, AmBank released its very first financial assistant that helps you with credit card related customer services. 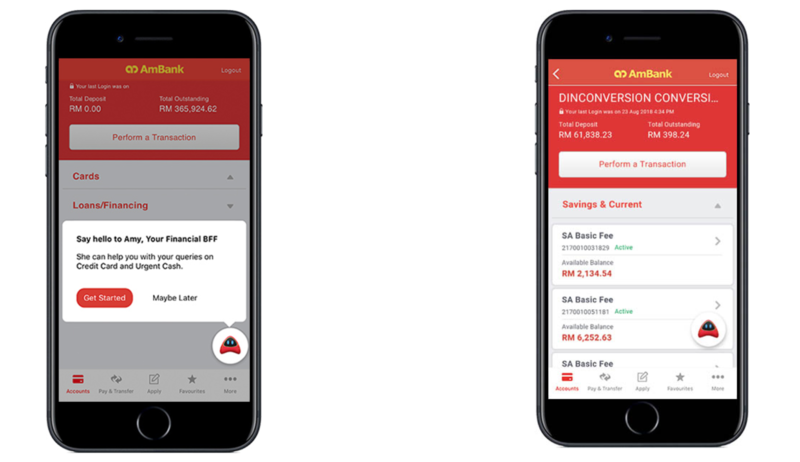 Named as AMY (an acronym for AmBank Malaysia), the virtual financial assistant has been embedded into AmOnline Mobile App for both iOS and Android devices. 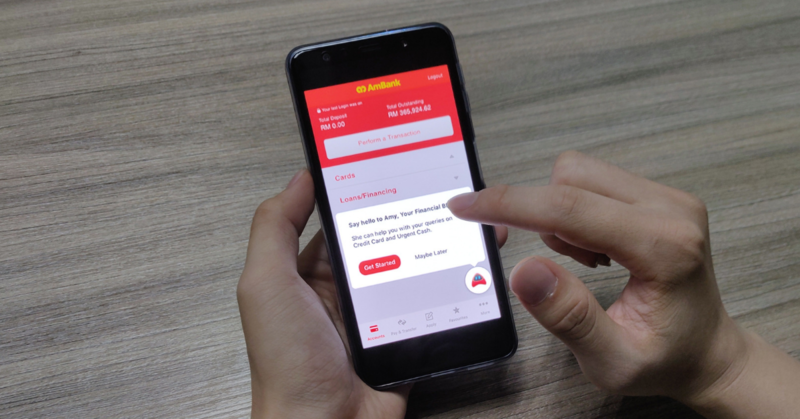 This effort falls in line with the digital push and focus on the AmOnline personal online banking platform that AmBank has had the past year. To access AMY’s services, just log into AmOnline mobile application and you can pull up the virtual assistant with a single tap. 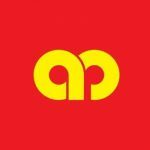 According to AmBank Group Chief Operation Officer, Datuk Iswaraan Suppiah, AMY’s current capabilities were designed to address the topmost reasons why customers call the AmBank customer service hotline or visit a Branch. So What Can AMY Do For Me? AMY can almost do anything a regular customer service agent can do, with regards to credit card matters. You can get advice on which credit card suits your current lifestyle. If you lose your credit card, you can block it immediately and arrange for a replacement card. You can keep updated with the ETA of your credit card wherever you are and activate the card once you’ve received it. If you’re out shopping and you forget your PIN number, you can reset it immediately. If you maxed out your credit card, you can get a temporary credit limit increase on your card. Other services it can help with is getting urgent cash and checking your credit card application status. If you apply for a new credit card, AMY will ask you whether you’ve received it after the bank has dispatched it out. If not, she will trigger an investigation into the delay. If you block a lost card, she will look up addresses on your file and ask where is best for her to send the replacement. In her current credit card service avatar, AMY shines in her simplicity and lives up to the promise of letting you get it done in half the time or less. Currently, AMY functions through self-guided chats and chat menus, which works well since its repertoire is credit cards. As the number of “customer intents” that AMY can fulfill are expanded, there are plans to introduce Natural Language Processing (NLP) which will allow AMY to respond to free-text questions as you use when chatting with a human. Dictionary Time: Natural Language Processing is a component of AI—it basically helps computers to understand human language as it is spoken. With NLP, computers can read text, hear speech, interpret it, measure sentiment and even determine which parts are important. AmBank’s vision for AMY is for it to be a personalised service that is usually reserved for affluent customers available to all customers by harnessing machine learning and AI technologies. With more financial advisory and customer service capabilities in the pipeline, AmBank says it is committed to increasing the complexity of needs that AMY can handle, while maintaining a simple and fast experience. You can download AmOnline on the App Store for iOS devices and on the Google Play Store for Android devices.